Today, U.S. Rep. Michele Bachmann, eager for a few minutes in the media limelight but evincing little appreciation of Sacrifice in Service to Country, participated in a drive-by dissing of decorated war hero Bob Dole, essentially characterizing him as a loser. In my book, Bob Dole is a genuine American hero. 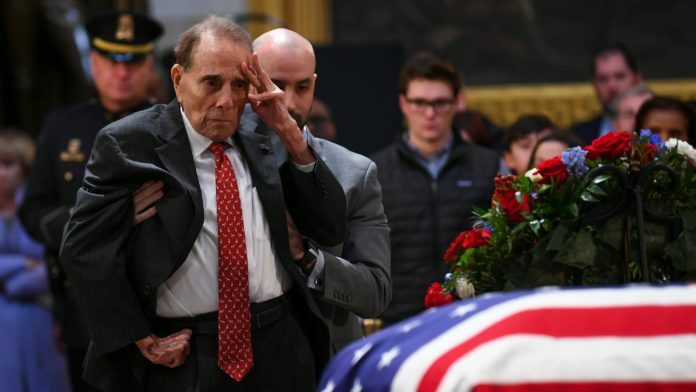 Gravely wounded on the battlefield in World War II while attempting to drag a comrade to safety under heavy enemy fire, 2 Lt. Dole was decorated for valor, earning the Bronze Star with Oak Leaf Cluster and two Purple Hearts. 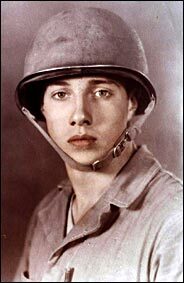 Bob Dole, off to war in 1945. My suggestion to Bachmann: Read Dole’s autobiography, My One Soldier’s Story: A Memoir (HarperCollins, 2005), in which he recounts his service as a 21-year-old second lieutenant and platoon leader in the Army’s 10th Mountain Division. Today on her radio program, Laura Ingraham interviewed guest Rep. Michele Bachmann (R-MN) and asked her about the ideological direction of the Republican Party. The pair discussed recent statements made by retired GOP Senate Majority Leaders Bill Frist (TN) and Bob Dole (KS) in support of some type of comprehensive health reform. INGRAHAM: Of course. God bless Bob Dole, he just came on our show, I have great respect for the man. And also for Frist. But Frist presided over a pretty disastrous situation in the Senate. INGRAHAM: They lost. And Bob Dole lost how many times on a national level? I guess I’ve lost count. […] That Republican ideology and that Republican outlook has been a losing outlook. That’s why President Obama wants more of us to be like them. BACHMANN: Because we want a pro-freedom agenda. And he’s trying to throw people around who he believes will increase a non-pro-freedom agenda. Rep. Michele Bachmann and Laura Ingraham trash Republicans Bill Frist and Bob Dole. Laura Ingraham says Nancy Pelosi opposes Michele Bachmann because of her gender. * Bill Prendergast has written an excellent critique of the New York Times puff piece on Bachmann, which I’ll reprint on this site next week. Rep. Michele Bachmann (R-MN) has reappeared, this time on the Laura Ingraham radio show where she accused past GOP Senate Majority Leaders, Bob Dole and Bill Frist, as being representative of a “non pro-freedom agenda” because of their support of health care reform. He’s 88 now and visibly frail after struggling with serious health problems in recent years. He hasn’t held public office since 1996, when he stepped down as Senate majority leader to run against President Clinton, who defeated him in a electoral landslide. He lost his bid to become vice president as President Ford’s running mate in 1976, and failed to win the Republican presidential nomination in 1980, and again in 1988. Dole made it clear he believes the rise of the so-called super-PACS that can contribute unlimited amounts of money to political campaigns are distorting the electoral process by putting candidates who are not well-known at a disadvantage. “We were always told there’s too much money in politics, and now that’s probably true,” he said. And while he declined to offer an assessment of Senate Minority Leader Mitch McConnell, or compare his performance to his own as minority leader from 1987-95, Dole noted that when he was there, the Senate was “more collegial and we trusted each other.” He also criticized the “use and overuse” of the filibuster. Dole pointed out that he has since joined with three former majority leaders, Democrats Tom Daschle and George Mitchell and Republican Howard Baker, to form the Bipartisan Policy Center, a nonprofit think tank, to develop bipartisan support for federal policies. Clearly, Dole is enjoying life in his twilight years, even though they’ve been marked by a series of health problems, mostly stemming from his war injuries, that have regularly hospitalized him since 2001. He spent most of 2010 in Walter Reed Army Hospital recovering from knee surgery and pneumonia, and another week there in 2011 for treatment of an infection. The Political Personalities of 1996 U.S. Presidential Candidates Bill Clinton and Bob Dole (Aubrey Immelman, Leadership Quarterly, Vol. 9, No. 3, Special Issue: Political Leadership, Fall 1998, pp. 335–366). A Comparison of the Political Personalities of 1996 U.S. Presidential Candidates Bill Clinton and Bob Dole (Paper presented by Aubrey Immelman at the 19th Annual Scientific Meeting of the International Society of Political Psychology, Vancouver, BC, June 30–July 3, 1996).